VERY GOOD! maybe attach a gallery of pics of both studios as a link? Worth noting is this Gates board was likely just used for monitoring, which sort of makes it's presence somewhat inconsequential. Though no one has been able to confirm for sure. I guess it might have been used for some inputting purposes. I wonder how the pres are on it. But you're right, Desper noted that they were more or less going straight from mic to preamp to tape whenever possible. Even when they had the Quad-8 set-up, Desper preferred to bypass the mixer whenever possible. 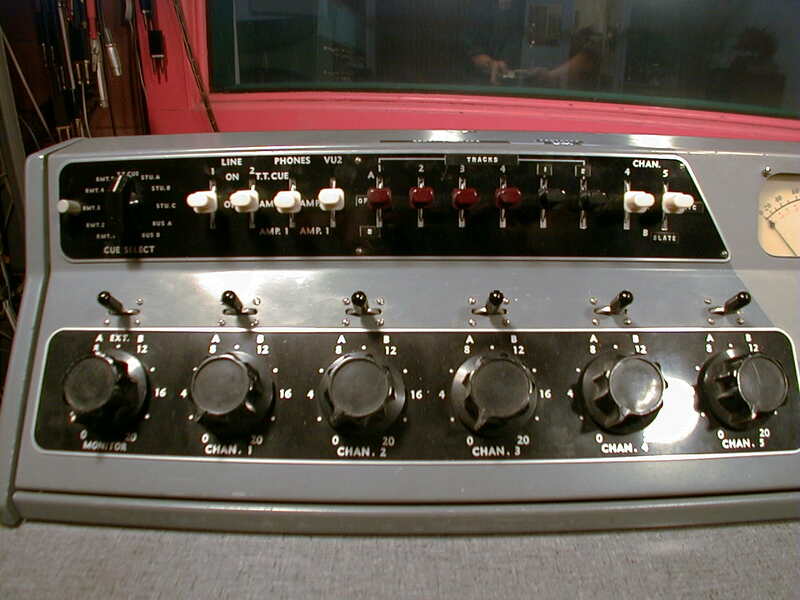 Not knowing the exact specs on the Dualux, I would imagine the EQ curves and whatever else and the overall "tuning" of the board would be geared more for the broadcast world than the recording world, so it would put a different character on certain things that the average listener wouldn't notice but the engineers would. But help me understand something: Jim Lockert engineered Smiley Smile for the most part, and he eventually mixed everything at Wally Heider's. So it would ultimately be his call on how the signal flow was set up. And Jim having worked with the 610's at UA would ultimately be working the same way: mic-preamp-tape, because those modular boards with the 610's were basically a row of preamps going straight to tape...not as much of a "board" unless you wanted it to be as it was a series of individual 610 preamps or channel strips in series. Am I understanding that correctly, at least in the direct recording process of it? There wasn't really a "board" coloring anything (at least not like the classic boards which had a distinct color or character) if they were going straight into the 610's when recording at UA. So the Dualux becomes less important overall, but it sounds like something an old-school engineer like Jim may have asked for for the purpose of playback and monitoring. So perhaps the whole "Frankenstein" studio wasn't that radical of a departure anyway, if the Dualux board didn't add anything to the tracking process? Sounds like a reasonable assumption. I imagine they might have used to Dualux to combine instruments to one track, live, at least occasionally, but the possibility is good that the Dualux never actually outputted anything to tape. The question then might be, what were they using going into the tape machine? This was before much of an outboard pre-amp market. But it would not have been hard to rig up a few units. They might have even had some rackmount 610s or something they could just patch into. There's some basic info on the home studio in the 2010 edition of ESQ devoted to Sunflower's 40th anniversary. There were two distinct phases: the initial, very ad-hoc setup for Smiley Smile et al, where, I believe, the mixing desk was on the kitchen table, and the later more stable setup where the control room was in the chauffeur's quarters, overlooking the room from a height of about 15 feet. BTW, Friends was recorded with the Dualux. "Search" fubction is your friend. COMMENT: I'm sorry Andrew G. Doe, but you are completely wrong in your statements, or the publication you quote is wrong. Not too far back you will find a post with my complete description of these times and the two house studios. I was there. I know. Look back into the archives of Stephen W. Desper's posts. (1) Brian had a large, library/study. it was well isolated from the formal living room, used for recording. (Large houses have "formal" and "informal" living rooms.) All equipment was located in the study. Closed circuit TV and audio connect the two. (2) The chauffeur's quarters remained a storage area until I converted them to a reverb chamber months later. (3) The eventual control room looked over the studio from about 12 feet, but that was after the formal living room was converted to a proper studio environment. A complete description of the home studio I designed will soon be available in a public publication of RECORDING THE BEACH BOYS. Around Christmas. COMMENT: What?? Where do you posters come up with this stuff? There is no "tuning" of the board or the room. It was flat. Monitors were 604E Altecs. There was no "broadcast influence" (whatever that is?) or any influence in the sound. The Gates board was quite good sounding and had been used for other recording projects by other artists. Jimmy patched audio and vocals through the Gates board. I was the one who likes to use as little active equipment when recording -- to keep things pure. The reason for this is to keep noise down to inaudible levels. The "Frankenstein" studios, as you call them, did provide you, that's right, YOU, with an album of Beach Boy music. The Gates board was a stop-gap solution to helping Brian back into a creative state-of-mind. Jimmy used equipment from Hider, but did not mix there, it was not an actual studio for mixing, only sweetening. Mixed at Sunset or Capital or RCA or Western, depending on the song. The Bellagio studio was referred to as "Brother Studio" on several AFM sheets. Yes...on the AFMs, it's referred to as "Beach Boys Studio" from the "Smiley Smile" days until some of the later "Sunflower" sessions, at which point it's referred to interchangably as "Brother Recording Studio" on some, "Beach Boys Studio" on others, and simply by the "10452 Beallagio Road" address on still others. By the time of the "So Tough" sessions, it's referred to as "Brother Studio" consistently, as it is on that album's inner gatefold sleeve. After the return from Holland, Brother Studio become the 4th Street, Santa Monica location. This will surely help us clear up all of these myths and misinformation. I am curious about the capacity to which the Gates board was used ... you have mentioned your preference for outboard preamps in the past ... were these Universal Audio modules? Wow. I can not wait Mr. Depser. Really by Christmas though? That's right around the corner! Hope you're right though! I know you meant 5th St., C-man. Brother Studio at 1454 5th St, Santa Monica. Recommend getting the update to Mr. Desper's "Recording The Beach Boys" as soon as it comes out. I was lucky enough to pick up a couple of copies of the 'first printing' of the publication directly from Steve as soon as it was offered for sale. Soon after, he sold out and there were no more copies available for purchase. That was it! I'm looking forward to this update next month if it indeed happens! Thanks for all your efforts to uncover the facts everyone! And thanks to those of you who helped get the articles up and off the ground. As I've posted previously, I'm trying my best to increase coverage of the 1967-1977 period for the band, and you guys are helping tremendously. The reason I'm doing this is because I know that just a simple Wikipedia browsing session can lead a casual fan to becoming a dedicated fan. Unfortunately for the Beach Boys, the complete focus on '66 and '67 and neglect all of all other eras truly hurts a lot of people discovering good music. It took me about 12 months to check out Holland for example because all I saw during my Wikipedia browsing session was biased information calling the album a complete critical and commercial failure with Allmusic giving the album a 2/5 and Robert Christgau a C. I since discovered that while a few people may not like it, a couple of people do, and the albums even made a few "Best of All Time" lists, so I chucked that information into the pot and hopefully that leads to a couple of people who could actually enjoy the album to not make the same mistake I did. Also, just a little fact for consumption, since I improved the coverage and ease of access to the American Spring page, I've managed to increase traffic to the article over 400%, so I think there's definitely a demand for all this information, it just needs to be written and all linked together. Corrections always welcomed. The source for the mixing desk on the kitchen table was Jim Lockert in conversation with a friend. The other stuff I misremembered from your book, the expansion of which I eagerly await. COMMENT: What?? Where do you posters come up with this stuff? There is no "tuning" of the board or the room. It was flat. Monitors were 604E Altecs. There was no "broadcast influence" (whatever that is?) or any influence in the sound. There's no need to be rude, Steve. Craig "Guitarfool" comes up with this stuff from decades of research. If he's wrong he's wrong, but is it really so outrageous to think that a radio broadcast board might be set up to accommodate radio applications? Corrections are indeed welcome, but I thought that response was a little dismissive of Craig's knowledge. I was not looking to impugn anything or anyone in my post, I think the "Frankenstein" description was taken the wrong way, or taken as a slight which was not intended by my use of the term. I use it because in another interest and career of mine, guitars, one of the most famous guitars in rock history is Eddie Van Halen's "Frankenstein", which was a guitar made up of various replacement parts, borrowed parts, and some bought from traditional shops that would not normally have fit together to form a workable whole in the world which was guitar in 1977-78, yet Eddie managed to construct such an instrument which not only delivered terrific sound a playability, but became an icon which fans adore and which has been copied endlessly since. So the term "Frankenstein" gets used by people I deal with regularly when we talk about borrowing and swapping parts which shouldn't fit in order to make something better or workable, as in "I was going to Frankenstein my Strat with those tuners/pickups/pots/switches/frets...". I'm 100% serious, maybe it's just a small part of the deal but I mean no malice or ridicule when I apply that term, it's just something I use to describe a collection of parts which are put together to form a whole. I'm the first to say "corrections are more than welcome"...I'm just pulling from conversations, study, research, all the usual ways of gathering information short of actually being there. I try to be accurate, complete, give credit where due, etc. I don't wish to debate or dispute to any personal degree, and if I'm wrong I'll gladly correct anything incorrectly stated on this or other forums. The broadcast board information comes from what I have heard about various radio broadcast boards having a certain "color" or EQ range or response or whatever the case may be in order for broadcast engineers to state a preference for one board's "sound" over another. This from engineers who collect and restore these older model boards, or those engineers who had previously worked on those boards who state a preference or praise a certain board's sound or features. I'm not a broadcast engineer, I leave those tastes up to them and their experience in that field when they say there is a difference in the sound from one model board to another, and I don't know if they're just talking shop or blowing smoke any more than anyone in a specific trade who talks shop - I equate it to me saying I prefer the Tube Screamer TS-10 over the more favored TS-9: it means nothing outside of that profession and if someone reads that, they might assume it to be true across the board. If the Gates Dualux is "flat", that's the fact of the matter and we'll take it as such. But if sometime another engineer happens to post something about the board's sound and response and how it wasn't as good as another, I'll take that into consideration as well: Again, as someone researching and interested in studying this material decades after the fact, I'm only taking in all the info I can find, not editorializing or trying to impugn anyone's statements over another, because like those researching any facet of history I wasn't there and can only go on what information is presented. I really wish I had the opportunity to speak with Jim Lockert, or Chuck Britz, or anyone involved in this music who is no longer with us, if anything just to thank them and hear some of their words in person. All that exists are their previous words and interviews, and in this case one of the published interviews with Jim about his work on Smiley Smile appeared in the Byron Preiss book where he described mixing Smiley Smile at Wally Heider's Studio Three, and how he did final mixing and editing of the album in an all night marathon session, which one assistant called a "miracle". That's the source I used for that particular information, but if it is incorrect or doesn't provide all of the information, any and all additions or corrections would be more than welcome, in fact it's the corrections which are often the most interesting! I just wanted to clarify those points and again say I feel some of the terms and statements in my post were misunderstood or taken in a way which I did not intend them to be. As someone who engineered some of my favorite recordings, worked closely with some of my biggest musical influences, and is one of the best sources of information and very, very generously willing to share it with interested fans, I respect Mr. Desper very much and consider myself a fan and one who has been very influenced by his work in my own musical and recording pursuits. I want to be sure that is absolutely clear in anything I write here, as I mean no disrespect. And as I mentioned with not having the chance to offer this to Chuck Britz and Jim, I might not post it here as often but I offer my gratitude and a big "Thank You" to Mr. Desper for all his work on this incredible music. It has been an inspiration. But I think the root of the issue is that we tend to elaborate/guess and fill in the gaps where there is no info. I'm the one who stated the Gates was likely not used for anything other than monitoring (which seems as if it might be incorrect? ), based specifically on Desper's previous posts which indicated that they used outboard preamps. But a lot of times, we are just guessing based on the info that is available. When more info is presented, we can then form a better picture. I was actually about to make a list of the tape machines, tape types that were used for this Wiki but stopped myself because I'm not 100% sure and I don't want to go down on record as being the guy who provided false info for the Wiki. I do know the 3M M23 was used in '68-'69, and the 3M M56 after that. And Desper has mentioned most masters being recorded on Agfa PER-525. Of course, this was the '68-'71 era. I would also guess that 'Friends' was not recorded or mixed on Agfa tape ... just a guess based on a sound character. It sounds like Scotch 201 to me. Of course, the tapes may always go through several generations of dubs on different stock and a variety of machines before they reach our ears. Not sure what mix decks were used -- probably a variety of rented machines? Likely suspects: 3M M23, Scully 280, Ampex AG-350, Ampex AG-300, Ampex AG-440. It's possible the older Ampex tube machines (300, 354, 350, 351) were utilized as well. And they had the Quad-8 board after the Gates. Also, I don't think the Gates board was used on 'Friends', but can't be certain. COMMENT: When I intend to be rude, aeijtzsche, you will know it, otherwise I believe I am about as tolerant and polite as you could want. I have worked in "radio." I don't need research. The so-called "tuning" of a radio station or the "station's sound" is not a function of console design, turntable pickups, or cart machines -- all of which may sound different one to the other. Each station's unique sound is tailored by the settings of graphic EQ, band specific limiters, phase chasers, and sum/difference comparators, all usually inserted right before the transmitter. There are even engineers who travel from one station to another who's specialty is station tuning -- and they are highly paid. This is what I believe Guitarfool was referring to when he said that a console was "broadcast tuned." That chain of equipment is never used in a recording application. He said what he said with authority, not in question. I read and do not comment on many things posted on Smileysmile.net that are inaccurate. This one I did make a comment about because it was so completely wrong but presented as fact. Frankly I would consider it rude to state conjecture as fact, but I'm not about to call anyone names, especially Guitarfool who I know to be a very informed poster and dedicated Beach Boy fan, someone who's postings I always like to read, along with yours. As to the use of "Frankenstine" to describe the unusual application of equipment, I now understand your use of the word. It's kind of like saying a system was a "Rub Goldburg collection of stuff." Wally Hider was a sweetening room. I guess you could do a mix in it, but it was very small. Hider rented out many makes of tape recorders. The Scully 280 was used by Lockert at the house. I switched to the 3M when I took over. When you say, ". 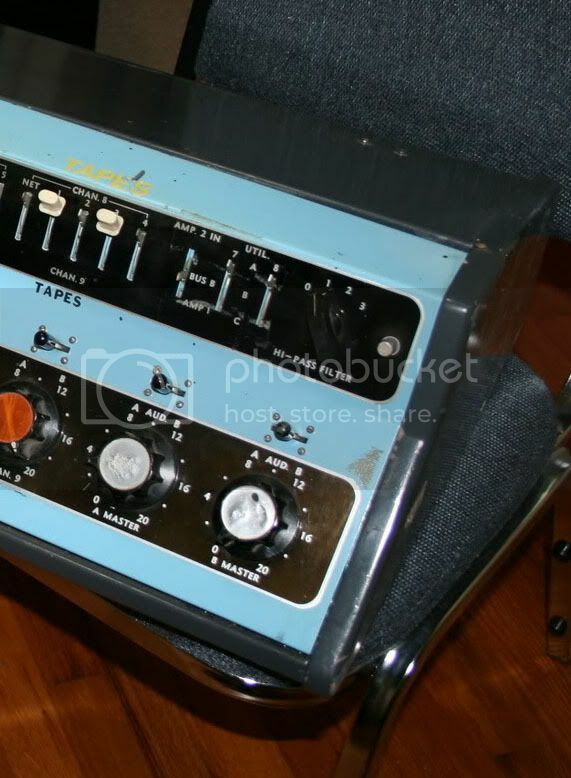 . . those modular boards with the 610's were basically a row of preamps going straight to tape...not as much of a "board" unless you wanted it to be as it was a series of individual 610 preamps or channel strips in series. ", as a console designer, I have no idea what you mean. Consoles are preamps connected in parallel through combining networks (passive nets in the case of the UA) and never go straight to anything. This quoted statement is a collection of half-truths. So in telling you the facts, I hope you do not consider me as being rude. Fine, I appreciate you responding, Stephen, and you are indeed extremely polite. However, I still think you're a little too quick to assume that we are presenting our ideas as hard facts. As you say, we weren't there--but we wish we were, and these threads on a message board are not scholarly articles, they're a place to spitball ideas amongst each other. If we were publishing these things in a book, obviously that would cross the line. I understand that you are only one person with other things to do than monitor every conversation we get into here. So by all means, correct us or clarify things for us as you can or as you feel like. We definitely appreciate it and it's very helpful to get your input as we sift through the historical record. In some cases, the historical record includes personal conversations people have had with other engineers, like Jimmy or Chuck Britz. Lockert has had published comments about the recording of Smiley Smile and Wild Honey in print from somewhat shortly after the event. That is where we've gotten a lot of information, directly from Jim Lockert. It's not like we're making this stuff up. There is a lot of conjecture involved, yes, but there is a lot of documented stuff too, that you are of course free and welcome to disagree with, but saying something like "what?? [with the two question marks, especially] where do you posters get this stuff?" is unnecessarily dismissive of the historical record. In short, we get this stuff from documented historical evidence and personal experience. If it contradicts your experience, to paraphrase Whitman, very well, let it contradict, it contains multitudes. Stephen, when you close your eyes and think back, you are able to be transported into the studio 40 years ago with the Beach Boys and with the musicians. None of us can do that, and this exploration is part of trying to get closer to that. It's bound to involve some theories and hypotheses. And as you know, the only way to test a hypothesis is to put it out there, test it, and expose it to experts. If you feel like it's a chore to correct us, then don't. But know that we deeply value your contributions. As somebody with technical expertise, and as somebody who was there, you offer a very unique and valuable set of knowledge to offer. We cannot get a complete picture of life in the studio, during the time period you were there, without you. But also know that we are going to keep hypothesizing, throwing out ideas, referring to the print sources, and we are going to keep being wrong on some things. You don't have a duty to police our facts. We have a lot of people here who are very concerned with the veracity of information, which is why you should assume that any sort of factual assertion is couched, on some level, in hypothetical terms. This is not an admonition or anything--I just want to make sure that we can all collaborate in the best, most meaningful way possible to get to an accurate historical record without hurting each other's feelings. OK, so back to the Dualux for a moment. "is a dual program design, controlling two separate lines. You could run the AM on one program and the FM on the other. It has nine mixing channels, five microphone, two turntables, one remote and one network. It has 21 input circuits, seven for mic, four TT, five remotes, 1 network and four tape. Response is ± 1.5 db 30-15,000 cycles with distortion 1% or less. Noise -60 db or better. It’s 46.5 inches wide and weighs 205 pounds!" "Dualux - 1956 - Dual 9 pot Mono (nine channels, two masters and monitor pot). In 1960, it was $1,795"
"This was produced with two versions of preamplifier, the early version used 5879 preamp tubes and the later production model used EF-86. " Stephen -- any recollection of which version the Beach Boys used? Indeed, there seems to be no on-board EQ of any kind. I seem to recall Stephen mentioning that Jim Lockert had added a bus or something? I may be wrong but I'd consider a hi-pass filter an EQ, if it affects the frequencies. I appreciate the time you have taken to make the very well written points in your response. They are all good points. I don’t have any problem with what you wrote. It’s just that I, Stephen W. Desper (a poster of substance) do not like being accused of impoliteness or of being rude by anyone hiding in the shadow of their enigmatical identity. You Sir or Madam, know who I am, but I know nothing of you. You state, “You don’t have a duty to police our facts.” I would further ask you; who are you aeijtzsche? Who are you to tell me about duty? Who made you the behavioral monitor? Am I missing something here? Who is this “we” and “our” to which you keep referring? Do you represent a consortium of fans, or is this the imperial “we,” the royal pronoun you keep using just your style. If you’re going to scold me, I’d like a little disclosure from my accusers. I get the impression from your posts that you have access to Beach Boy AFM statements, you talk about tape boxes in the vault, you tell us about tracking sheets inside tape boxes, and listening to outtakes . . . Just exactly what do you expect those of us with real identities on this website, those of us who put our name and reputation on the line with every post, to believe without question, so-called facts posted by unaccredited posters with unpronounceable nametags? Where indeed do you get this stuff? Do you work for some Beach Boy Enterprise, incognito, or are your posts the stuff dreams are made of, such as the Classic Studio Sessions website? I don’t think it’s rude to question questionable sources, especially when those sources post "spitball ideas" as if factual. This is suppose to be a fun place to visit. Now I find myself going away from that objective and I don't like it. So in the interest of our mutual fondness for all things Beach Boy, let us move on to the topic at hand. The broadcast consoles rented by Wally Heider were once about the only game in town. These were designed to essentially be signal routers and blend sound signals. EQ and Limiting were not needed because all you were doing was using a microphone to announce a record on a turntable or a commercial from a cart machine or tape recorder. EQ and Limiting was added up-line. Therefore you will not find EQ on these radio consoles. The four-position switch you point to as a manipulator of “frequencies” is really a high-pass filter. Its purpose was to keep low frequencies from the airways – such as blasts from “P’s” or rumble from A/C or fans. Just because this filter effects “the frequencies” as you put it, does not make it an equalizer. A volume control is an all-pass filter, but is not considered an equalizer. To learn of the differences between EQ and Filtration, please review the article in SoundOnSound Magazine at >>> http://www.soundonsound.com/sos/jan05/articles/qa0105-4.htm. To use EQ, Filters, or Limiters with such consoles, a whole breed of outboard equipment is there to be patched into the side-chain of any input of these console’s. The side-chain patch is what we now call an AUX input. When a patch-cord plug is inserted into the side-chain, the signal is diverted into the outboard piece of equipment desired, acted upon by that equipment, and then re-directed back into the side-chain as if part of the console’s signal path. Thus an 8-input console may well have stacked next to it, eight pultec EQ units, or other frequency manipulating devices. Or, a limiter may be inserted . . . or both in tandem. By the way, great photos of those old consoles. When the Gates was at the house, along with it were many Pultec midrange and/or program EQs and UA1176 limiters. These two units are all you need to make great sounding records. Lockart had access to anything he wanted from Heider’s. Jimmy grew up with these units and taught me a few tricks with them. He was a great ‘ol guy who, unfortunately smoked too much, which eventually took his life via emphysema. Just for information - yes, aeijtzsche has had access, legal access, to the Brother vault during a spell when he was assisting Alan Boyd in LA. If he cites tape box labels or tracking sheets, he has indeed seen, often handled, those items. I'm the one who, according she-who-must-not-be-named, makes up everything I post. Oh, and steals AFM sheets. Well I wish I knew what all this stuff meant about mixing and boards and such, but I don't so I'll stay out of it and just state that I can't wait for Mr. Desper's new edition to release. Yeah, I, that is to say, Joshua M. Hoisington of Grand Rapids, Michigan, have worked in official capacity for the Beach Boys. I have hesitated to make what did for Alan seem more exciting than it was--most of what I did was either transporting or cataloging, and when I left I relinquished access to most materials. I do still have access to the database, as it existed in 2007, of all the written documentation of the Beach Boys vault. So anything that was written on a tape box, on documents inside, and of especial interest, console tape...I have access to that plus some other miscellaneous documentation. It has been very useful for research purposes. I also took extremely copious notes on unreleased tracks, particularly tracking sessions with in-studio discussions and what not, when I had full access to the audio catalog. That has proved to be helpful as well. COMMENT: Good I'm glad we got that part cleared up! I hope you understand that with anonymity comes invalidation. Posting incognito is OK, but when representing information as valid, you need to overcome the invalidation which comes with anonymity by associating the information with someone valid & whose name is known. Otherwise people like me may question the data, its interpretation and application. Usually it’s the interpretation that is wrong because it goes so far back – to another time. Thank you for letting us all know of your exciting experiences working in the vault and with Alan. He’s quite a great guy. If I can help you figure that mess out (40 years of storage) let me know. I’ve got to get back to my book editing. Why don’t you both give me some questions to answer. If not already answered in the book, I’ll address the issues in the book in detail. And I've got a question for you, if you don't mind. How did you come up with the tag "aeijtzsche"? I found this old post in the SmileySmile archives and modified it for clarity . . . COMMENT: I have answered this question in detail, if you can somehow look back at past postings, but here in a few words is what the scene was. The question before management was should a studio be built at Brian's home or not. Someone said let's try it out. At that time I was working mostly on the road, but eventually returned to LA and was able to help Jimmy Lockard with recordings. Jimmy was a well-seasoned, senior engineer who had been hired (through Heider Studios) to make the home tryout happen, as he was a quite capable engineer. His easy going personality was good chemistry with Brian. He rented a Gates Radio Company console normally designed for radio work. Being a console it was not difficult to connect it in such a way that it would function as a recording console. He rented Altec speakers that Brian liked, a 4- then 8-track track from Heider. With a closed circuit TV system between the large living room and Brian's den, across the hallway entrance (foyer) and, oh yes, some headphones and a mic or five, booms -- all the needed equipment, including 1176 Limiters, Mid-Range Pultec and Program Pultec EQ units, to make recording possible. In the control room (Brian’s den) the console sat on Brian’s large mahogany desk and Jim, being a big fellow, took to Brian’s large executive leather chair while working the console. The TV monitor had its own stand. Other equipment, limiters and EQ’s were stacked on the desk. Recorders to the side and back. The Den was large so even with five or six other people, it was still comfortable. It had heavy draped gothic windows and dark wood shelves of books, so the acoustics were rather dry – a good thing. We recorded like that for several months. Jim and I traded sessions back and forth as his health demanded more bed rest. Then a big tour was being booked. This was a very aggressive tour. Many cities were scheduled. The tour was several months long. Michael wanted the band to own its own sound enforcement system, designed for their needs. During this design time and while the tour was happening, Jimmy and Brian mixed down the past recorded songs that had, as of that date, not been mixed. Since recording at Brian’s home was keeping Brian behind a mic, it was decided to build four consoles, special amplifiers, and good microphones for this huge tour in the US and Europe. I was to design the system keeping in mind that the same equipment would be used in a recording studio setting at Brian’s house upon return to LA. The system, actually two systems, designed at a cost of $200,000 in 1960-70 dollars. The system was designed and built for the tour in about six weeks by Quad-8, a motion picture console manufacturer. Upon the ending of that tour, a team called Mancini’s Building Crew converted one of two living rooms in Brian's house to a studio and control room. Like the Wracking Crew bonded musicians together for gigs, Mancini’s crew banded carpenters together whose specialty was building recording studios. About seven or eight men worked three days to convert Brian’s Informal Living Room into a workable studio and control room. It took several weeks to build the monitor speakers and wire the control room. During that time Jimmy’s rented equipment was returned and Jimmy retired to deal with his increasing repertory problems. Several months later an echo chamber was added, but that’s another story. When the Gates was at the house, along with it were many Pultec midrange and/or program EQs and UA1176 limiters. These two units are all you need to make great sounding records. Lockart had access to anything he wanted from Heider’s. Jimmy grew up with these units and taught me a few tricks with them. What sort of tricks? Any random example will do me I mean - a UA1176 hasn't got a great deal of controls (not that this should matter particularly). Really looking forward to the revised version of your book Stephen. Powered by SMF 1.1.21 | SMF © 2015, Simple Machines Page created in 0.389 seconds with 21 queries.